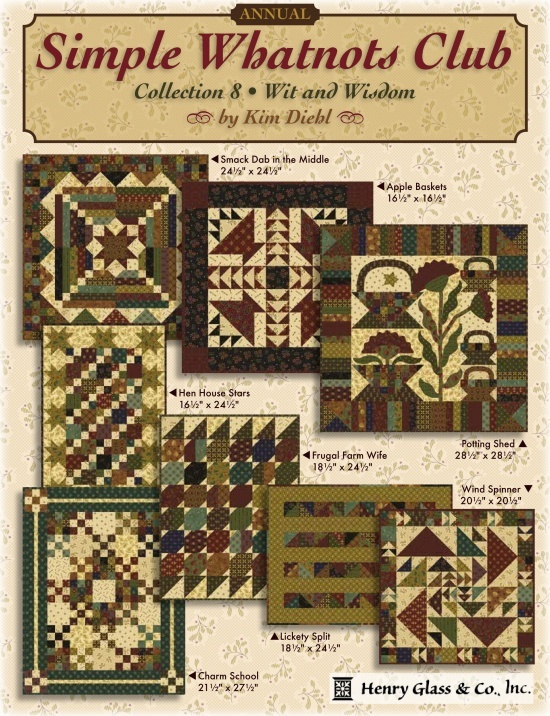 Kim Diehl's new fabric line Wit & Wisdom. 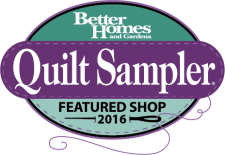 Each month you will receive all the fabric for that months miniature quilt along with the pattern. Backing fabric available but sold separately at 10% OFF. Apple Baskets 16 1/2" x 16 1/2"
Charm School 21 1/2" x 27 1/2"
Frugal Farm Wife 18 1/2" x 24 1/2"
Hen House Stars 16 1/2" x 24 1/2"
Lickety Split 18 1/2" x 24 1/2"
Potting Shed 28 1/2" x 28 1/2"
Smack Dab in the Middle 24 1/2" x 24 1/2"
Wind Spinner 20 1/2" x 20 1/2"
This program will begin mid January 2019. Price is $35.95 per month for eight months.